DISCLOSURE: I received a complimentary product from Influenster to facilitate this review. My opinions are my own. 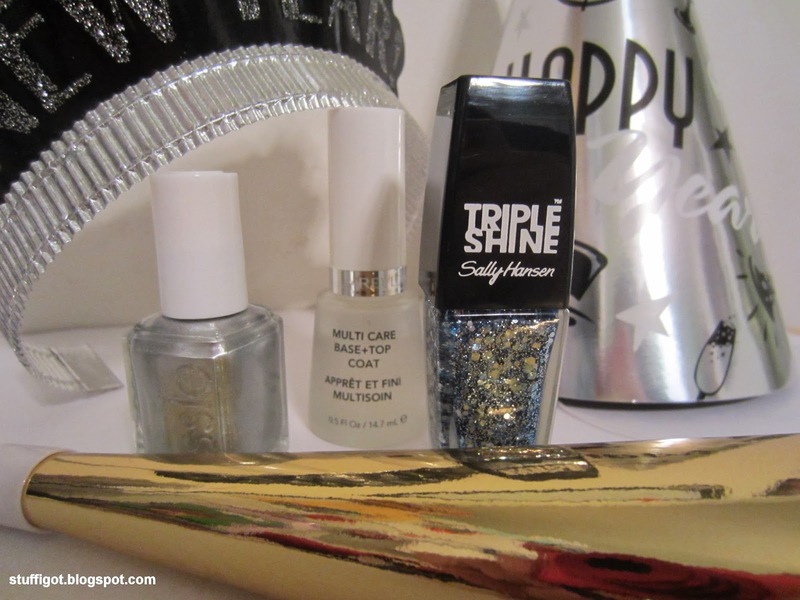 It's New Year's Eve and what perfect time to review a new nail polish! 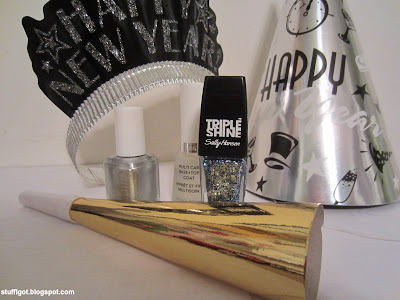 I received a bottle of Sally Hansen Triple Shine Nail Color and I thought it would be awesome to use for a fun New Year's Eve mani. The Triple Shine line is available in 29 shades and is formulated to give you non-stop shine. It features an Ultimate Shield Complex, which is designed to help polish withstand the wear and tear of everyday living. I received #390 Sparks Fly. 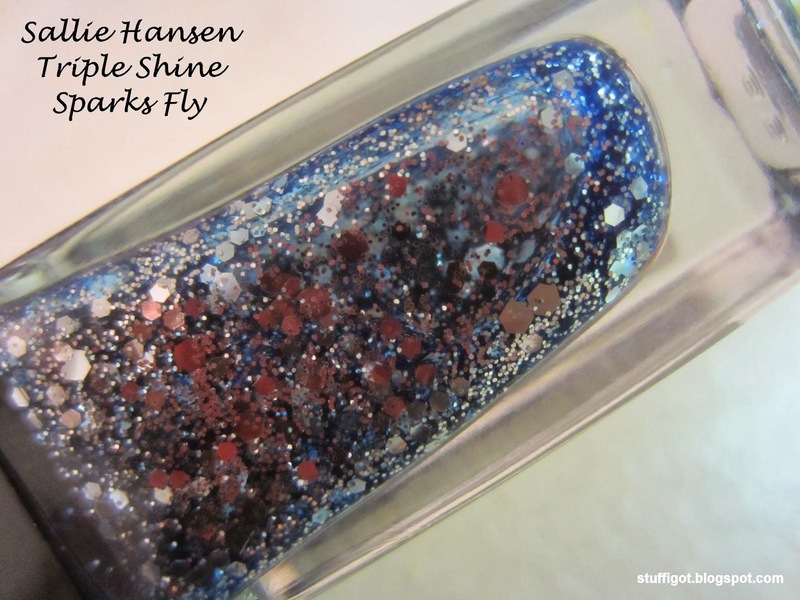 It's a sheer blue polish with small and large hexagonal glitter, as well as micro glitter. It's a festive color that's easy to apply. The polish has a wide and flat brush, similar to the Sally Hansen Insta-Dry and Complete Salon polishes. For my New Year's Eve mani, I decided to use a solid color base underneath the Sally Hansen Triple Shine, since the polish is so sheer. I used Essie "No Place Like Chrome" as my base and Revlon Multi Care Base + Top Coat. I'm really bad at applying my own nail polish and if I had had the time, I would have had a professional manicure done with the base color, before trying to use the Triple Shine. So, please excuse my messy application! 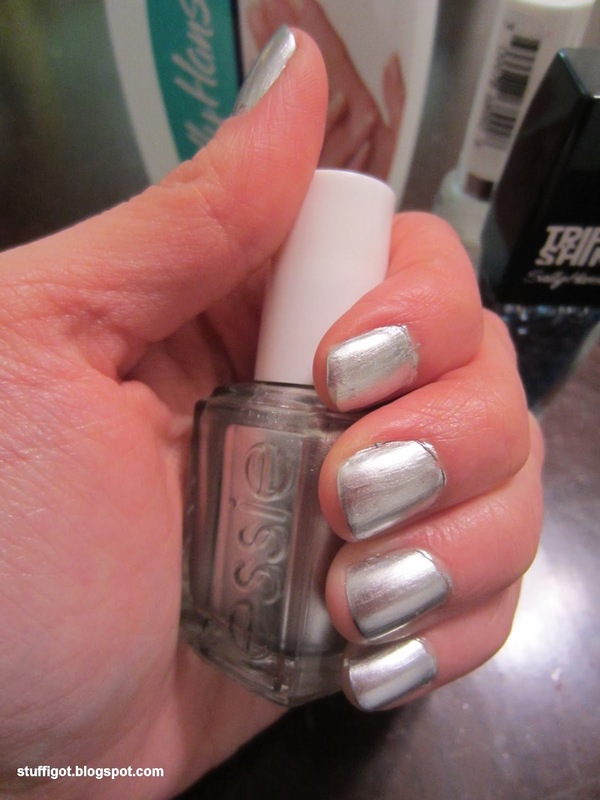 After buffing and applying a clear base coat, I applied two coats of the Essie "No Place Like Chrome." 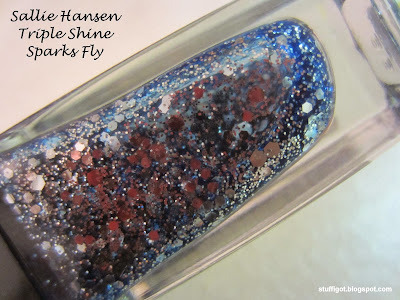 After it dried, I applied two coats of the Sally Hansen Triple Shine in Sparks Fly. Again, excuse the messy application! But, I thought it came out pretty. Perfect for the New Year's Eve parties you'll be hitting tonight! Yes! The polish comes in a variety of different colors and if you're good at applying your own nail polish, then you could have fun with this! How much does it cost? It retails for $4.99. Where can I buy it? Available at all major drug stores, mass merchandisers, grocery stores and online retailers.